PON TAREAS EN LOS PUPITRES! Rewrite the sentence, replacing the direct object with the object pronoun. Use study sheet. 1.Yo no devuelvo el libro a la. 1 PON TAREAS EN LOS PUPITRES! Rewrite the sentence, replacing the direct object with the object pronoun. Use study sheet. 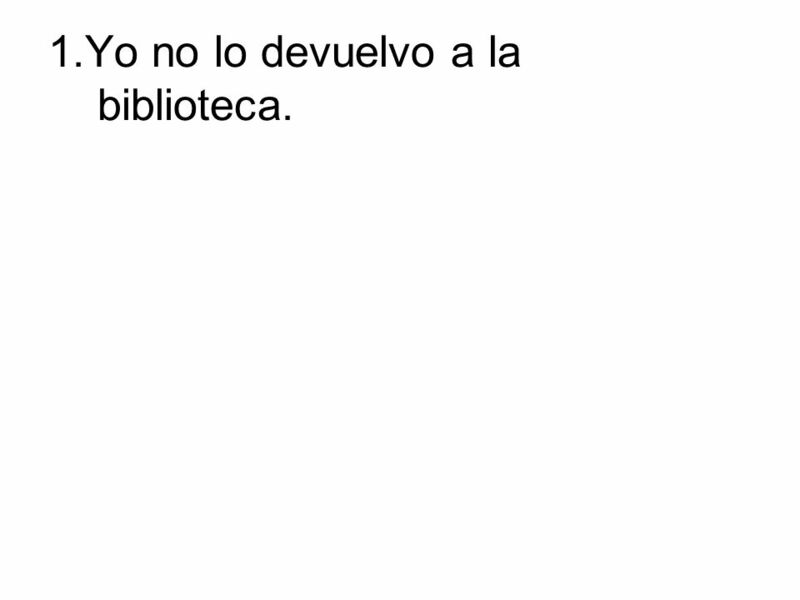 1.Yo no devuelvo el libro a la biblioteca. 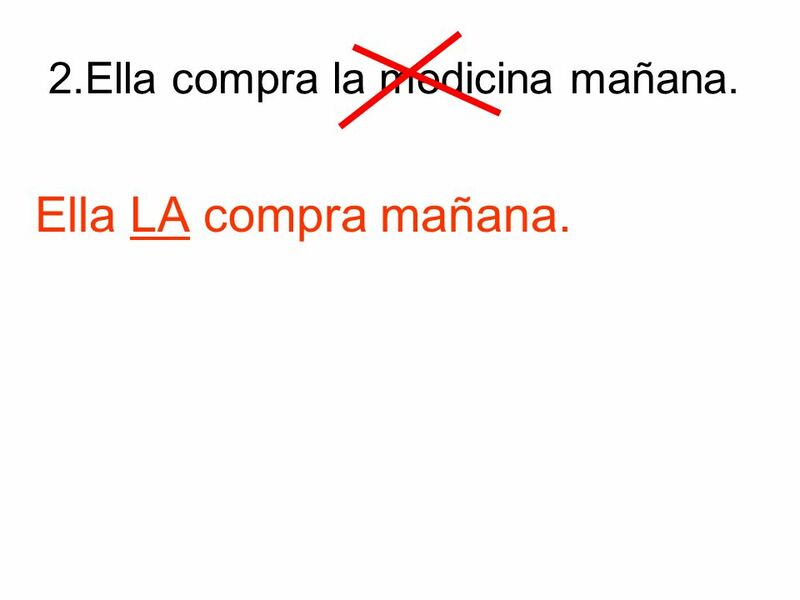 2.Ella compra la medicina mañana. 3. ¿Por qué no envías las tarjetas hoy? 2 1.Yo no devuelvo el libro a la biblioteca. Yo no LO devuelvo a la biblioteca. 3 2.Ella compra la medicina mañana. Ella LA compra mañana. 4 3.¿Por qué no envías las tarjetas hoy? ¿Por qué no LAS envías hoy? 5 ¡Traduzca en inglés! 1.Yo no lo devuelvo a la biblioteca. 2.Ella la compra en la panadería. 3. ¿Por qué no las envías primero? 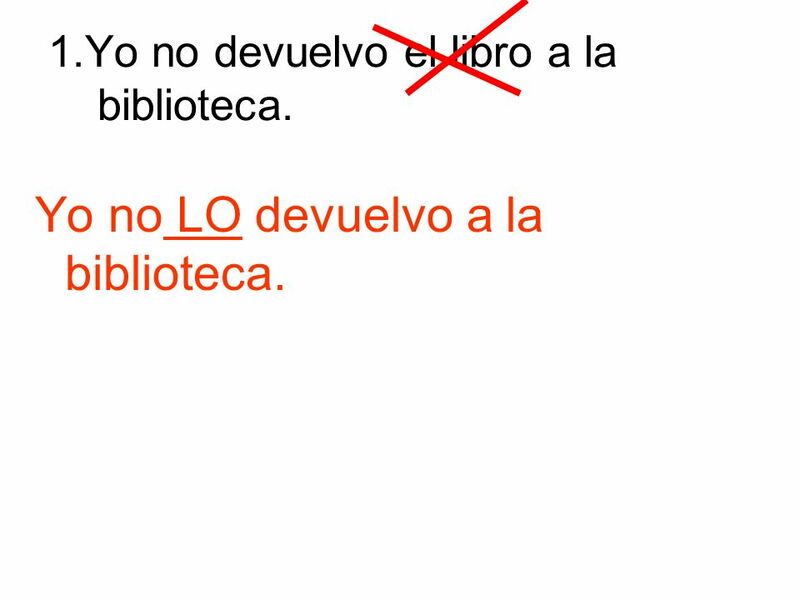 6 1.Yo no lo devuelvo a la biblioteca. 7 Im not returning it to the library. Im not taking it back to the library. 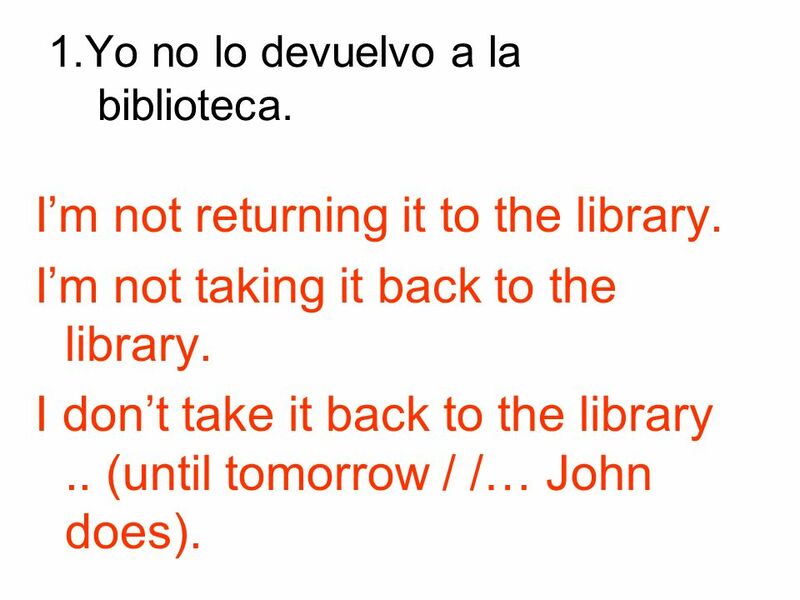 I dont take it back to the library.. (until tomorrow / /… John does). 8 2.Ella la compra en la panadería. Shes buying it at the bakery (shop). She buys it at the bakery (shop). 9 3.¿Por qué no las envías primero? Why arent you sending them first? 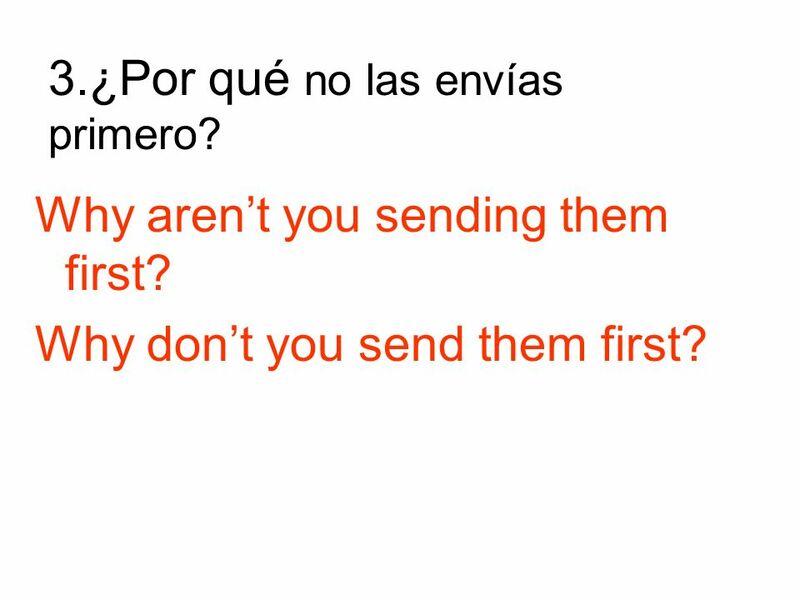 Why dont you send them first? Descargar ppt "PON TAREAS EN LOS PUPITRES! Rewrite the sentence, replacing the direct object with the object pronoun. Use study sheet. 1.Yo no devuelvo el libro a la." ¡Pasa tareas (numero)! ¡Traduzca en inglés! El Verbo “Ir” To go. Ir Used for destinations To go somewhere Must use the personal “a” afterwards. Los interrogativos. ¿dónde? ¿Dónde está Ramona? Ramona está en la biblioteca. where? Ramona is in the library. Where is Ramona? ¿adónde? ¿de dónde? a. 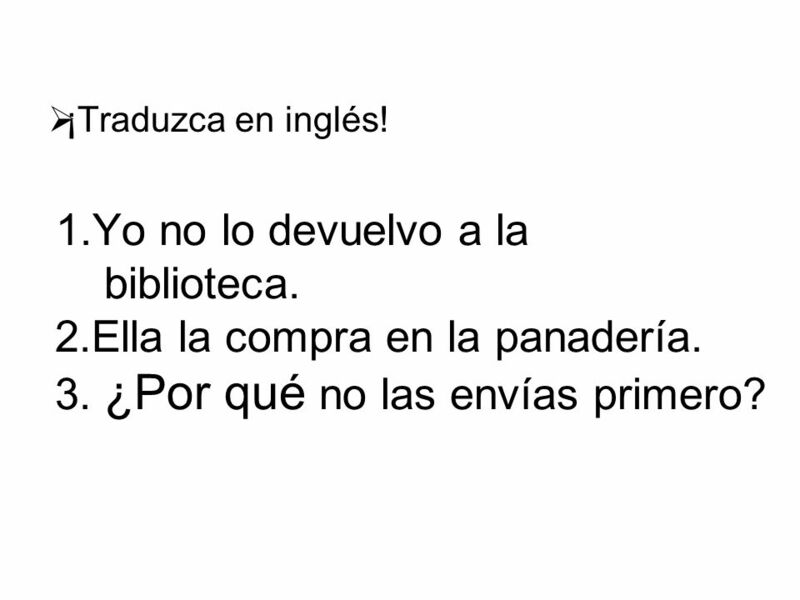 Double Object Pronouns-p Objetivo:  Los estudiantes póndran usar los pronombres directos e indirectos juntos en las oraciones. DIRECT OBJECT PRONOUNS. DIRECT OBJECTS The object that directly receives the action of the verb is called the direct object. Mary kicked the ball. 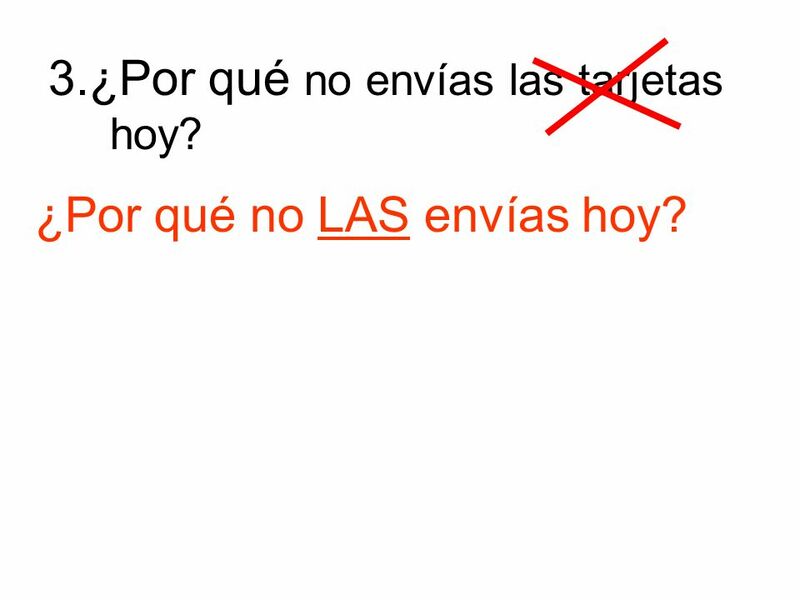 "Ball"
Direct Object Pronouns New notes #64. Direct Objects Receive the action of the verb Receive the action of the verb Answer who or what Answer who or what. Direct object – who or what receives the action of a verb. Rafael pone la mesa. What is being set?la mesa new - When the direct object is a person, a personal. Direct Objects Complementos directos. ¿Qué es el completemento directo? 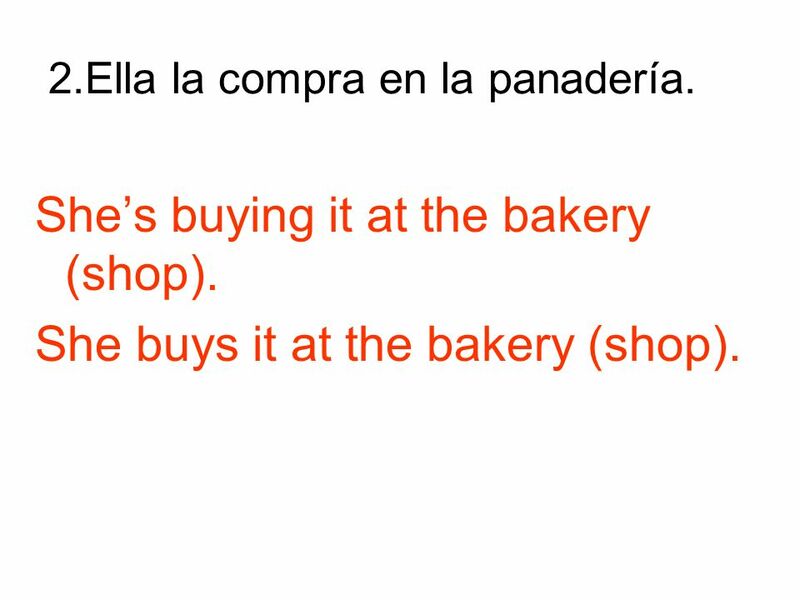 En inglés A direct objec answers what or who after a verb Example: – I bought. Direct Object Pronouns - by themselves -with commands -with the present progressive. Study Guide/ Practice on DOP Spanish II. 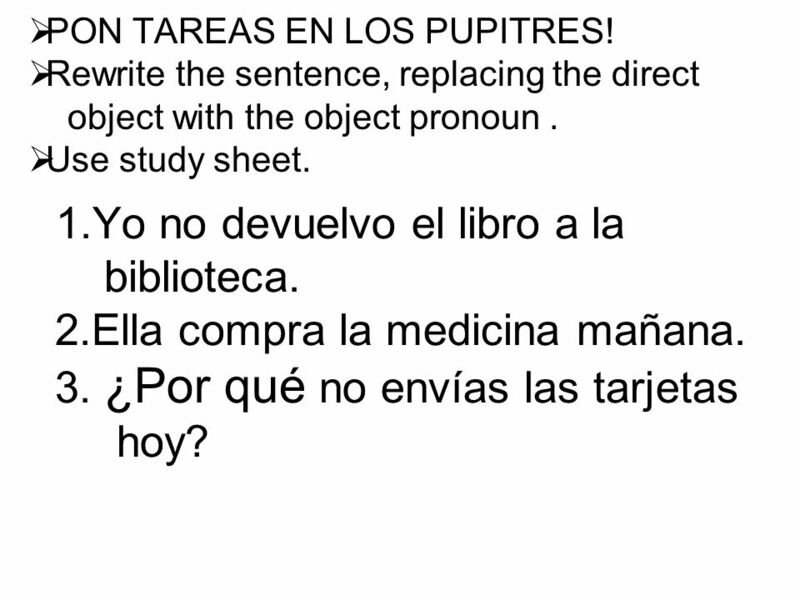 Rewrite each sentence in SPANISH using the correct direct object pronoun. Tú compraste los boletos. ________________________________________________.